Layman Pang Yun was also known by the stylised name of ‘Dao Xuan’ (道玄) which translates as ‘Profound Way’. He was from the Hengyang (衡阳) area of Hunan province, and is remembered as a very accomplished lay-practitioner of Ch’an Buddhism who studied under many great teachers, such as Mazu Daoyi (马祖道一) [709-788], Shitou Xiqian (石头希迁) [700-790], Danxia Tianran (丹霞天然) [739-824], Yaoshan Weiyan (药山惟俨) [751-834], Bai Ling (百灵) [dates unknown], Damei Fachang (大梅法常) [751-839], Luo Pu (洛浦) [dates unknown], Yangshan Huiji (仰山慧寂) [807-883] as well as many other prominent Ch’an masters. It was well known that he had achieved full enlightenment and later generations of eminent scholars routinely referred to him as China’s ‘Vimalakirti’ (Wei Mo Ji - 维摩诘) and as the rebirth of the great Buddhist scholar named Fu Dashi (傅大士) [497-569]. The common people referred to him as ‘Layman Pang’ (庞居士 – Pang Jushi), ‘Esteemed Pang’ (Pang – Weng - 庞翁) and Xiangyang Pang the Great Scholar (襄阳庞大士 – Xiang Yang Pang Da Shi). For generations the Pang family had been adherents of the Confucian School (儒 – Ru) and in his youth, Pang Yun had been a Confucian scholar. However, as Pang Yun wanted to understand the reality of existence, he took refuge in the Buddha and began the practice of the Buddhist method. In this quest he initially called on Ch’an Master Shitou Xiqian and asked: “Who is the person that does not associate with the ten thousand dharmas?” Master Shitou Xiqian moved his hand to cover the visitor’s mouth (and there was a sudden silence). At that exact moment, Pang Yun realised a profound understanding. Later, Pang Yun called on Ch’an Master Mazu Daoyi and asked him: “Who is the person that does not associate with the ten thousand dharmas?” Master Mazu Daoyi replied: “I will answer your question after you swallow all the water in the West River (西江 – Xi Jiang).” When Pang Yun heard this, he was immediately enlightened here and now. 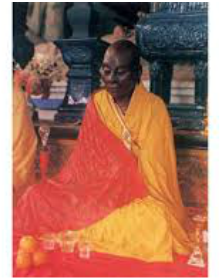 To deepen his understanding, Pang Yun stayed at the temple for two years and practised the Ch’an method. After this, Pang Yun broke his connection with the world of greed by gathering up his family’s many valuable possessions into a boat, where he had them all tipped into the Xiang River (湘江 – Xiang Jiang). Having broken with the worldly shackles of money and wealth accumulation, he took his wife and children to live at the foot of Deer Gate Mountain (鹿门山 – Lu Men Shan) where they made a living from cultivating the land. As Pang Yun was very happy after his breakthrough using the Ch’an method, he took to making objects from bamboo, which he sold in the local market to gain a small income. One day Pang Yun said: “As neither my son nor daughter will get married (due to their advanced states of Ch’an realisation), all my family can stay together and speak the language of the uncreate (无生话 – Wu Sheng Hua).” This is a truly remarkable story of an entire family of realised Buddhas! When Pang Yun knew that his own nirvana was near, he asked Ling Zhao (灵照) - his daughter - to go outside and see what time of day it was. Ling Zhao soon returned and said to her father: “The sun is in the middle of the sky (i.e. it is mid-day) but that there is an eclipse and the sun is now obscured from view!” Pang Yun (who was sat in meditation preparing to leave his body) was surprised to hear this, got up off of his seat and went outside to look. While her father was outside, Ling Zhao quickly sat in her father’s seat in the cross legged position, brought her palms together and passed away (with her body remaining upright). When Pang Yun returned indoors (after learning the eclipse was a hoax) he saw that his daughter was already dead. He smiled and said: “My daughter is most astute and nimble!” He delayed his passing into nirvana so that he could make arrangements for his daughter’s funeral. When the local Governor Yu Di (于頔) came to enquire about his health, Pang Yun answered: “All that matters is the direct realisation of the empty nature of all things. When this is achieved, that which is false is not perceived as real.” Pang Yun then placed his head on Yu Di’s knee and happily entered nirvana. When his wife heard of this she exclaimed: “first my crazy daughter leaves me, and now my ignorant old husband! Neither considered my well-being – how cruel they are!” When she told her son, her son stopped working in the field and after making a ‘Ga’ (嘎) sound, he placed his chin on the handle of hoe and entered nirvana standing-up. Soon after this, his mother arranged for his body to be cremated. The Pang family entering nirvana whilst sitting, lying or standing had won the admiration of people far and wide. Mrs Pang – after witnessing her family leave the world in this extraordinary manner – retired into an isolated place and was never heard of again.